From the photoshop look of the image I'd say that we're not looking at a real item just yet. At this point in time anything less than 24/96 is hard to take seriously. The difference in audio quality is just too blatantly obvious. 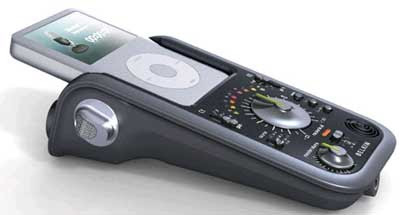 I've been eagerly waiting for a serious way to use my iPod as a field recorder. Well, since this is not the case, I'm happy I gave up and bought an Edirol R-09. A great idea, but it doesn't appear to have phantom power based on the detailed photos in the engadget link. Which renders it almost completely useless for good field recordings. Le sigh. In some videopodcast, I think it was think geek or something, they featured it. it was shown an this years macworld. should be hitting the stores pretty soon though. its june '08 now. Is there any news on a release date?